Philadelphia—On Wednesday, March 12th, City Council held a historic public hearing on Philadelphia’s compliance with ICE holds, which are non-mandatory requests from the federal immigration enforcement office to local Philadelphia law enforcement to hold someone who should otherwise be released. Immigrant leaders, advocates, and allies took the stand before Council’s Public Safety Committee to discuss the devastating impact of ICE holds on immigrant communities in Philadelphia and to call on the Mayor to work with community organizations to draft a new policy that ends all ICE holds. “We have an opportunity here to sit on the side of hope, of love and of justice by creating a policy that does not create divisions among our families, one that can begin to rebuild trust between local police and the community and one that will ultimately create a better Philadelphia for all us,” said Executive Director of Juntos, Erika Almiron. In testimony presented during the hearing, Director of Public Safety Michael Resnick announced that the Mayor is drafting a policy that would end the majority of ICE holds in Philadelphia. The Philadelphia Family Unity Network (PFUN) welcomes the Mayor’s initiative in drafting this policy, which would be a huge step forward for the city of Philadelphia, and is grateful for recent opportunities to meet with officials from the Mayor’s administration to provide input on the devastating impact of ICE holds on immigrant communities. According to Director Resnick, the proposed policy has not yet been finalized and “the administration is still open to discussion,” an announcement that was met with cheers from the audience in the hearing. Following the hearing, PFUN invited the Mayor’s office to meet with the coalition in the coming weeks to discuss concerns that remain about the proposed policy. As it stands, the policy would continue to use ICE holds against some individuals based on their criminal history. This type of complicated carve-out contradicts the city’s stance on redemption and rehabilitation for individuals leaving prison, creates confusion and mistakes in the implementation of the policy, and subjects the city to costly liability for unjustified imprisonment. Constitutional concerns with ICE holds will continue even if only one ICE hold remains. “The collaboration between local police and ICE has resulted in fear and distrust in immigrant communities and led to the perception that local police are actively seeking to enforce federal immigration laws. The proposed policy will also continue to send a message to immigrant communities that asking for police protection could subject them or those that they care about to deportation”, said Tasha Kelemen, Executive Director of the Pennsylvania Immigration and Citizenship Coalition (PICC). Members of PFUN have been involved in ongoing work with the city for a number of years about the possibility of enacting a policy that would end ICE holds and begin to intervene in the mass deportation of Philadelphia residents. “In our experience of doing work in coalition, we’ve found that policies often divide immigrant communities along lines of legal status, economic status, education, criminal history, gender identity, sexual orientation, family structure, and marital status, as well as other categories. We have worked hard in Philadelphia to build across communities innovatively in the face of these divisions to create a more understanding and collaborative immigrant community in the city,” said Mia-lia Kiernan, community organizer with 1Love Movement. PFUN continues to ask the Mayor to adopt a policy that reflects the work that has been done to bridge differences between communities, and honors our City’s stance on rehabilitation, re-entry and second chances. The coalition is inviting Mayor Nutter to meet with immigrant leaders and community members to listen to concerns about the harm caused by divisive policies before taking further action on his proposed executive order. 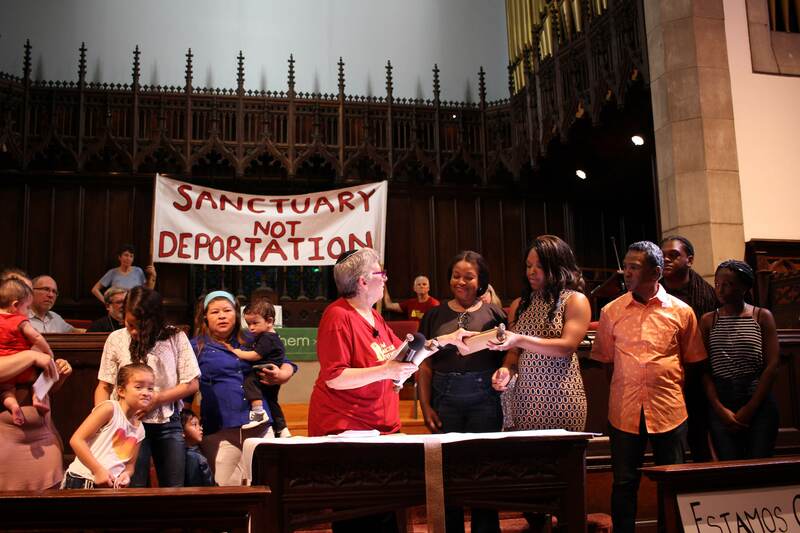 “Immigrants must have a place at the negotiation table with the Nutter Administration to express how ICE holds devastate our families and communities every day and to create a better policy,” says New Sanctuary Movement community organizer Blanca Pacheco. PFUN members: 1Love Movement, JUNTOS, New Sanctuary Movement of Philadelphia, Pennsylvania Immigration and Citizenship Coalition, and Victim/Witness Services of South Philadelphia.